MusicShifter is the most popular way to convert your CD collection to MP3, AAC, WMA, or Lossless digital music files. MusicShifter protects the investment in your CD collection by shifting your music to digital formats used by iPods and similar devices. Packaging and arrangements for shipping your CD collection to MusicShifter for processing. 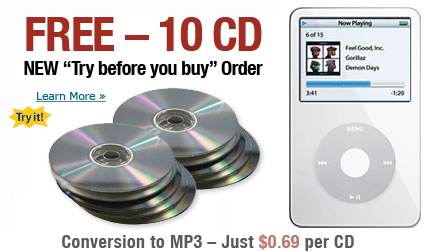 Professional grade conversion to MP3, AAC, WMA, or Lossless formats. Complimentary CD repair/resurfacing for scratched discs, and manual data entry for obscure albums. Professional album art for your music. Best in the industry for both quantity provided and accuracy. Return-ship your entire CD collection with your new digital music library loaded onto a flash drive, external hard drive, SD card, or NAS. Send your own, or purchase from us. Instruct you how to load your new digital music library onto your iPod (or similar device). With your new digital music library you'll be able to enjoy the freedom and flexibility that only digital music can provide. © 2004-2019 MusicShifter.com All rights reserved.